When using supply and demand to identify turning points in a market, a question that comes up often is, “How far back should I look for a supply and demand level”? The proper answer is this: Look back as far as you need to in order to find fresh demand and supply. The key word is fresh as those represent the highest probability turning points. At those points, you have the highest amount of unfilled buy and sell orders which is ultimately why prices turn. The OTA Supply and Demand grid has picked consistent turning points since its inception back in March 2012. The reason for the consistency is that we are focused on where banks and financial institutions are buying and selling, their demand and supply, nothing else. In other words, the levels that you see on the grid below are fresh demand and supply. Having this information as an income trader or longer-term investor is key. Notice the supply level above. Price declined from that area in strong fashion along with a few of our “odds enhancers” suggesting banks were big sellers of the USDJPY at that level. Half a month later, price rallied back to that level and fell, offering OTA grid members a low risk, high reward and high probability shorting opportunity. The question many students had was, how that level was found given that the last time price had been there was two weeks ago? While a full explanation is beyond the scope of this piece, we can explore some points of interest in hopes that the information will help take your trading to the next level. Sometimes we look back months and years to find fresh levels, when price is far out on the supply / demand curve. When we looked back, we looked for the picture on the chart that represented fresh demand, and there it was. It also had all our “Odds Enhancers” associated with it which made it a key level, as mentioned above. I am not suggesting that all the same sellers who were trying to sell at that level 2 weeks earlier were still sitting there with sell orders, though many likely are. 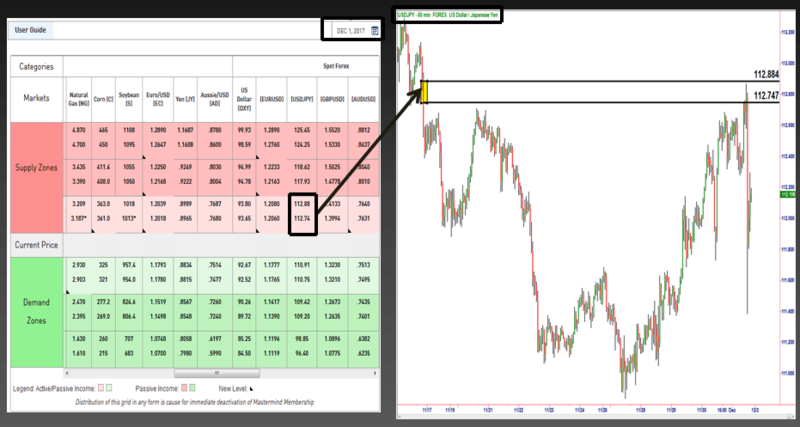 What the chart does tell us however, is the aggregate supply and demand equation at each price point in a market. If supply didn’t exceed demand at that level, price would not have turned and gone down. The key to knowing where market prices are going to turn in advance, and also where prices are going to go, with a very high degree of accuracy means knowing exactly what institution/bank demand and supply looks like on a price chart in any market and at any time frame. Understand that supply and demand levels created long ago can serve to be very strong levels. The fact that they were created long ago is not a bad thing, it’s actually a positive for three reasons. One of which is this… When a level has not been reached in a very long time, it, by definition, is very far out on the supply / demand curve meaning it’s a very high probability opportunity that will almost always have a huge profit zone with it.